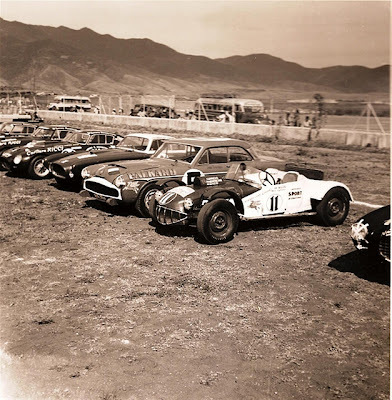 The La Carrera Panamericana...: Morning Qualifying – Whatsa Motto You? By Jennings R. Scroggs, Jr.
Jean Trevoux's Motto-bodied Packard during the 1953 Carrera Panamericana. 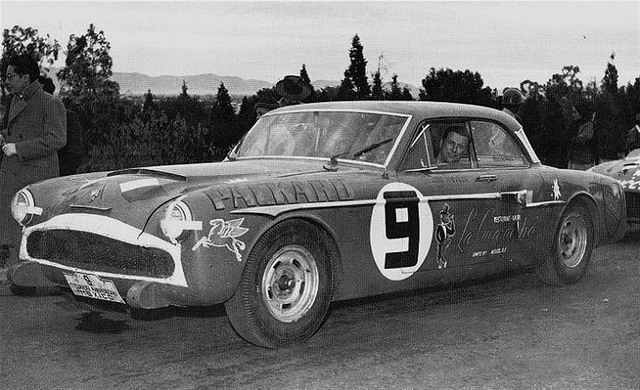 In yesterday’s MQ comments, the topic of big cars, generally, and Packards, in particular, came up with respect to the original Carrera Panamericana. 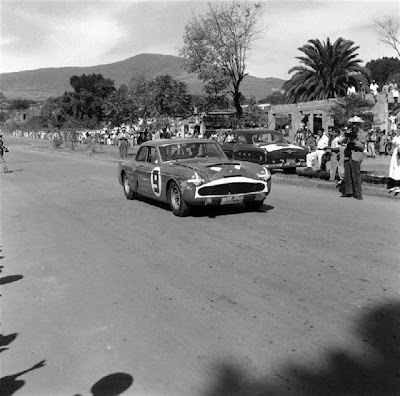 As it turned out, the driver of yesterday’s Monte Carlo Rally winning Delahaye, Jean Trevoux, also campaigned a custom bodied Packard in the 1953 and 1954 Carrera Panamericana. Both, the driver, and his car, have interesting stories. Trevoux, an engineer by trade, was the top test driver for the French manufacturer Hotchkiss in the 1930′s. Trevoux was also a gifted race car driver, and a regular competitor at Le Mans during the era; However, he was even better on the rally stages, winning the highly challenging Rallye du Maroc twice, and the Monte Carlo Rally four times; Most notable of which were Trevoux’s wins in 1939 (the last rally before the war) and 1949(the first rally after the war) in the same car, a Hotchkiss 686GS with the same co-driver, Marcel Lesurque. In 1940, Trevoux and Luigi Chenetti came to the US to prepare a pair of Maserati 8CLTs for the Indianapolis 500. Both men found themselves stranded in the US by the quickly shifting geopolitics of the day. While Chinetti spent the war years wining and dining with the top of the social registry building the personal relationships that he’d later use to sell Ferraris in America, Trevoux used his engineering skills in the defense industry building drive trains for tanks. After the war, Trevoux went to Mexico, met and married his wife, and opened a bar and restaurant, “La Cucaracha”. With the French auto industry’s slow post-war recovery, Jean was able to meet his obligations as Hotchkiss’s top test driver, compete in a few rallies, and still be a successful club owner in Mexico City. 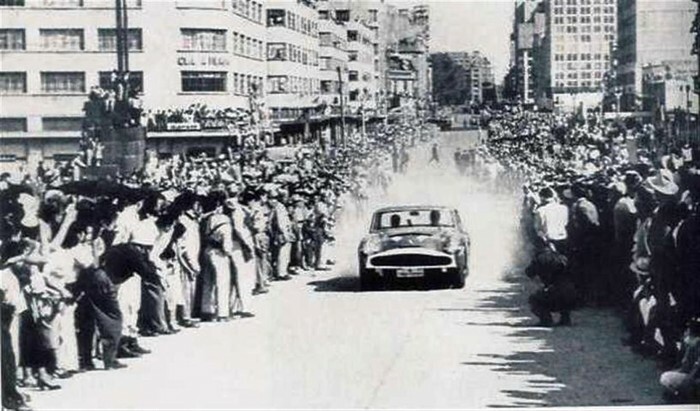 When Enrique Martín-Moreno organised the first Panamericana in 1950, Trevoux purchased a Motto bodied Delahaye 175s. 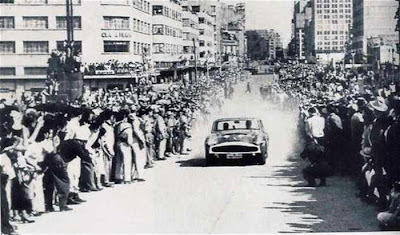 Trevoux finished 9th in the 1950 Carrera then shipped it to Europe, where he used it to win the 1951 Monte Carlo Rally. 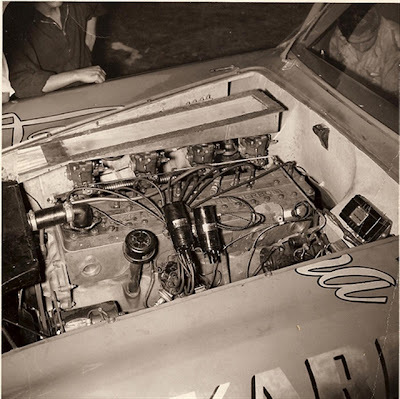 Trevoux and co-driver, Jean Bachereaux, in their Packard Motto Special. In 1952 and 1953, Trevoux competed in the Carrera with a standard Packard 200 coupe. He liked the solid build and engineering of the Packard and the power that its 327 cubic inch made. Trevoux realized that a lighter car, based on the Packard chassis and running gear could be a serious challenger for the next Carrera. So, he shipped a Packard 200 chassis to his old friends at Carrozzeria Rocco Motto in Turin. While no one has seen the car or Motto’s plans, it is believed that car had tubular steel frame supporting its aluminum body panels. Motto narrowed the Packard’s track by 4 inches, removed a foot off each end of the chassis while leaving the wheelbase unchanged, and significantly lowered the car’s stance. The drastic reduction in the chassis size, coupled with its snazzy aluminum clothes made the Motto Special 400 pounds lighter than a standard Packard 200. Trevoux sent the Packard’s straight eight to legendary drag racing pioneer, Howard Jahanson for a mild upgrade. Johanson slightly over bored the Packard’s eight, and added a custom 3/4 Howard camshaft. Johanson built a log-style, custom manifold for its four Stromberg carburetors. When completed, Johanson’s engine made over 300 hp. That power was fed via a Borg-Warner T85 3 speed transmission with overdrive to a 3:91 rear end. The front suspension had twin shocks at each corner and a stabilizer bar added to the stock front suspension. The larger, drum brakes from a Packard 400 boosted its stopping power. 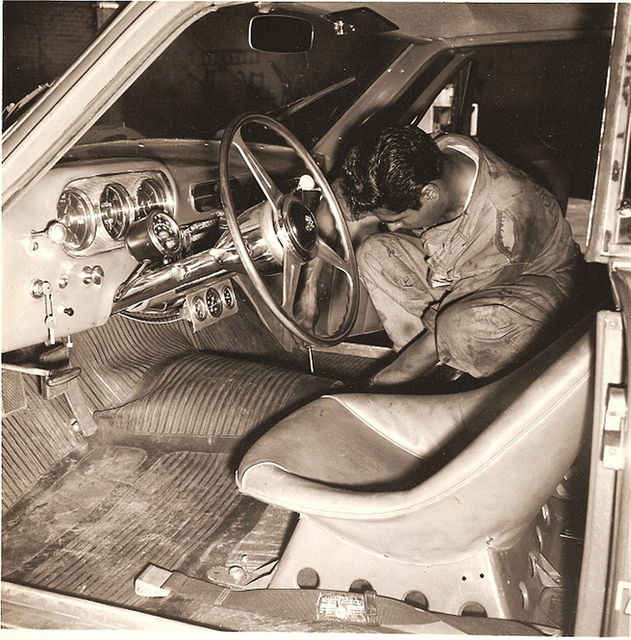 The interior was comfortable space working space for Trevoux and his co-drivers, Bachereaoux and Gonzalez. The dashboard is stock from a 1952 Packard 200, with a Nardi wheel, and padded, custom aluminum seats. Naturally, the back seat was removed. The Motto Special failed to finish in 1953 due to cracked oil pan, but returned with a strong, 13th place finish the following year. Trevoux retained ownership of the Motto Special for several years, before selling it to an unknown collector in Mexico City. It is believed that the car remains in “as raced” condition. His restaurant, “La Cucaracha” was ultimately sold to ﻿Don Pedro N. Rodríguez, father of Ricardo and Pedro. 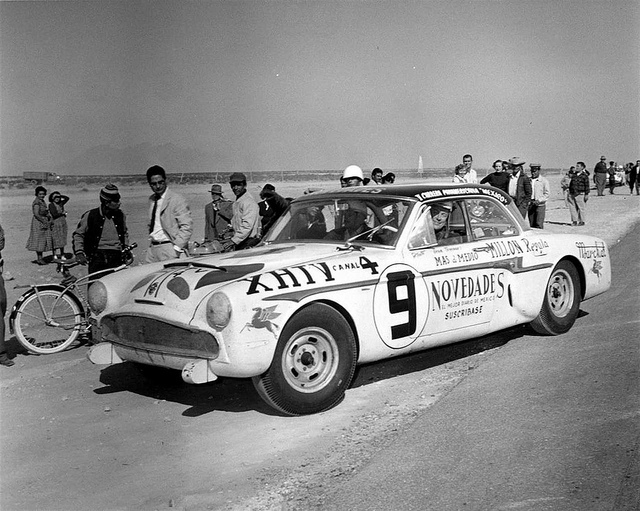 Trevoux actively supported the Rodriguez brothers and Moises Solana in their racing careers. Jean continued to race and rally for the rest of the decade. Trevoux and Enrique Martín-Moreno formed Autos Francia, who imported Peugeots to Mexico. Trevoux passed away in 1981. Trevoux and Armando Gonzalez during the 1954 Carrera Panamericana. What a fantastic tale! Great research, Gary. Wouldn't it be fantastic to get that car out and restore it for demos - or even Original Pan Am! What a fantastic tale! Great research, Gary. Wouldn't it be amazing to see that car and get it restored for demos - or Original Pan Am? Supposedly, the Packard Motto special has remained in the same private collection in Mexico since Trevoux sold the car in the late 70's.